All Forums >> [Artix Entertainment Games] >> Artix Entertainment General Discussion >> =AE= Spotted a parody, spoof, or puns in our games? Post it here! There is nothing new under the sun 2. This thread has been designed as a place for you to discuss parallels, influences, coincidences, or suspected parallels, influences, coincidences for the game as it relates to other media, stories, legends, myths, etcetera. This is to cut down on the number of new threads created about these topics often redundant ones. From here on any discussion on these topics should happen in the official thread and no where else in S&T. 3. No advertising for clans and whatnot. 4. No Character advice to be given or asked. 5. Signature use once per page. 6. http://forums2.battleon.com/f/tm.asp?m=3508688 - Read this, please. 7. No 'WOOT FIRST POST LAWLS' posts. Well I've been playing through Etherstorm in AQW. And at least as far as I've gotten I've noticed that you can get a smoke monster armor. And there's a hidden hatch leading to an underground area. And in the water there's a big plug sticking out of the ground. I wonder if the devs have been getting LOST lately? In the Pencil Doodle area, the saloon is closed until drawn. and there's a sketchy sun above it. Get it? Closed until drawn/dawn, smart one. The new bun rangers quest in aq represents a parody of Tommy, the Green ranger. And his dragonzord was appropiately named the "Dragonzard." The goldenrod monster is a tribute to Galdar. and lastly the ocarina item we get as a prize, is a tribute to tommy's dragon dagger flute and the Legend of zelda's ocarina. This Undead Ninja has been strengthened by Fire magic! It's now harder, better, faster, and stronger than before! Of course, the Flaming Skull miscs that are a reward from the war are a pretty obvious Ghost Rider reference, the description again tells it all. Flaming motorcycle and chains sold separately. pun: so artix was away from home, and daimyo broke is stuff...... so he gets mad and says "DAIM YO DOG!" - Post edited to combine double posts. In the future, please use the 'Edit' button to add/change your posts. Thanks! The rewards from the recent "A Journey Home" war in AdventureQuest appear to bring with it a pair of references. The new armour's description is a play on ZZ Top's "Sharp Dressed Man", while the new weapon references the "jerkface, genius doctor" kind of cane, which would seem to be a tongue-in-cheek nod to Dr. House's cane in House. In Epic Duel when fighting a Heavy Mechachillid they say "Two legs bad, Six Legs Good" which is a reference to Animal Farm by George Orwell. They also say "YOU SHALL NOT PASS" which is a reference to Gandolf from Lord of the Rings. Not sure if this was pointed out before, but here I go. The Giant Tale in AdventureQuest Worlds has a Giant named Andre, which is a reference to a wrestler that was called Andre the Giant. In gamehaven the boss is a plumber. And gameheven is video games. Mario is a plumber from video games. In AdventureQuest, one of the pre-battle lines a leprechaun can say is "Oi! Get back here! I'll bite your legs off!". This is a reference to the infamous "Black Knight" scene from Monty Python and the Holy Grail. When Life DIDN'T give Cap'n Rhubarb the limes that he needed for his journey, Cap'n didn't invent combustible anti-limes to burn down Life's house. Instead, he invented a blade that can drain the Vitamin C from your enemy! 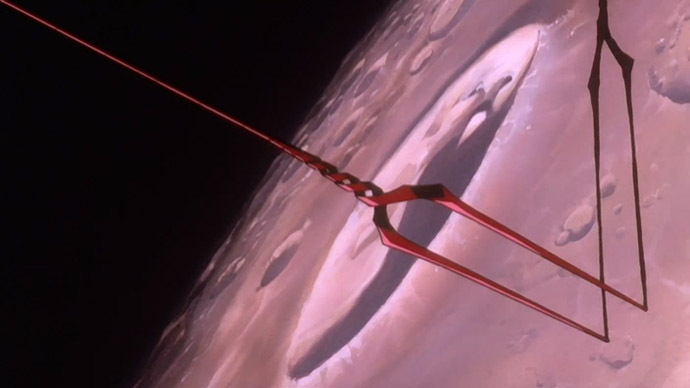 AQW's got This spear which has more than a passing resemblance to the Lance of Longinus from Neon Genesis Evangelion. The Ultraviolent Light spell in AQ happens to be a double-whammy. The name is based off of Douglas Adams' work, and the description (as well as the pop-up upon landing the stronger form of Dazzle) is a shout-out to Thomas Dolby's song "She Blinded Me With Science". 2) DF has a Doctor When, do I even need to point that out? In Falconreach, Lim has a quest called "Blackhole Fun!" Edit: In case you don't know it, here it is. Puns intended. From the laser screwdriwer weapon on DF. Who would use sonic. And almost same thing was said by the "Master" in Dr. Who episode. Maybe not inside the actual game, but in the old AQ3D game page the copyright reads, "Copyright © Artix Entertainment 2012. All rights reserved. All wrongs revengenated.". Thought it was a bit "pun-ish". If you haven't caught the reference, when AQ calls the gift boxes giftboxen, it's a reference to Brian Reagan's "Stupid in School" comedy. AQ: The Anti-Guardian's real name is Ghin Surrech, which totally sounds like Insurrect to me. This is derived from the word Insurrection, meaning a revolt. Ghin revolts against Guardians. Fun fact: I noticed this as I was experimenting with my MtG cards, because I was trying to make a deck with this very card. Best name for an NPC. Ever. Here's a quick parody i just realized from the 2011 mechquest gear games cutscene. Dean Warlic mentions girls just want to have fun, which is the title of a Cindy Lauper song from the 1980s. Following that Jaania makes 2 different references to the human brain by stating dendrites and neurons. Lastly, in that same cutscene, Casca makes a reference to the wizard of oz by mentioning flying monkies.